When your wedding is around the corner, you do not want to miss out the opportunity to celebrate your final days as a Bachelor or Bachelorette. For this reasons, your party needs to be unique, fun and of course wild. Booking a venue and arranging for drinks and dancers might be the standard way to have a bachelor or bachelorette event, but that is yesterday’s news. There’s an even better way to enjoy your special night. Hire a bachelor or bachelorette party bus! 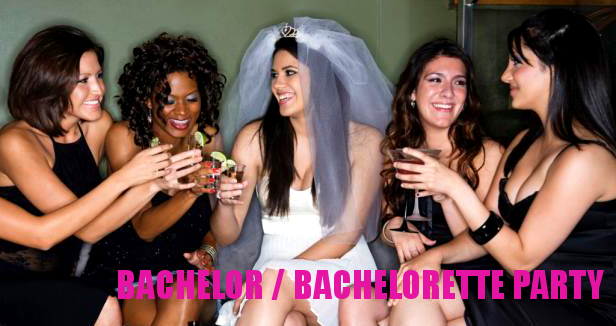 What is a Bachelor / Bachelorette Party Bus? If you have not been on a party bus yet, you are surely missing out! With overbooked nightclubs and boring restaurants, our bachelor / bachelorette party limo services offer a breath of fresh air and get the fun started from the moment everyone is aboard the bus. Each party bus is uniquely designed to be a club on wheels, and entertain even the pickiest of guests! What amenities can I expect in a party bus? When you think of bachelor / bachelorette party ideas, specifically party buses, you want to make sure that you select the right vehicle for the occasion. Each of our party bus rentals is designed differently with amenities such as flat screen TVs, DVD/CD players, IPOD connections, laser lights, and superior sound systems. Some Bachelor / Bachelorette party buses event have dance poles (for safety reasons of course)! All of these amenities are sure to lead to a memorable evening for the bride to be and her friends! How to arrange the evening itinerary? Our special party bus services offer package deals to take care of all necessary arrangements for bacehlor / bachelorette parties. All you need to do is bring the alcohol (must be 21 or older), music, and your guests! Our Bachelor / Bachelorette party buses will take you and your guest to any specified destination. You also have the option to stay on the bus and ride around throughout the night, making stops to use the restroom, or for a quick smoke break. The cost for a bachelor or bachelorette party bus, will depend on the number hours you need the bus, the type of vehicle you select, and the number of guests that will be traveling with you. There are no addition costs to make stops; however, if you ride beyond your specified time frame, you will be charger overtime fees, due upon exiting the party bus. You are also responsible for any damages done to the bus rental. When making a reservation for a party bus, be sure to do so well in advance to ensure your special night goes on without a hitch! Party buses for bachelor / bachelorette parties are in high demand, especially in the spring, so reserving a vehicle in advance is a must. You can make your reservation online, or call our customer support team at (954) 828-0219. You will be required to put down a non-refundable deposit for the limousine or party bus of your choice.